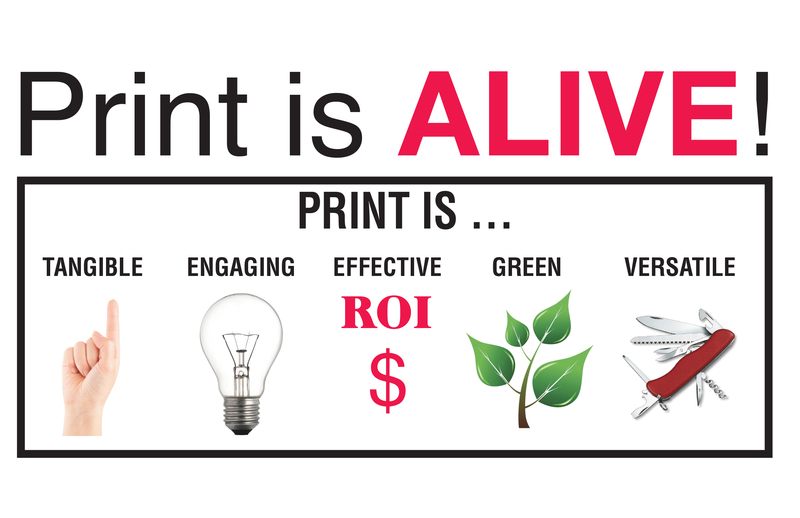 At Acme Printing we live by the philosophy that “Print is ALIVE!” Print is a value-added service that helps businesses gain new customers, increase revenue, and drive desired actions from consumers. Our goal is to help customers bridge the gap between online and traditional print marketing. The two go hand-and-hand working as partners to promote your business and overall increase your ROI. Print materials help build brand awareness, customers who receive print materials from a business are twice as likely to buy the next time they see you online. While online channels are able to provide brand messaging quickly, print channels are able to lock in long-term retention, emotional response, and directly impact purchase decisions. The versatility of print allows it to have distinct advantages digital marketing is unable to reproduce: personalization, tangibility, and environmental targeting are just a few. This optimizes your marketing strategy when you can maximize the advantages and dual function of both formats. Take social media for example—you can advertise with Facebook or Instagram, and you will receive impressions; but how many of those “impressions” are meaningful and not just scroll-throughs? You can see something online and forget about it minutes later or become easily distracted by another post, BUT if you have a hard, physical copy of a flyer or voucher, the chances are you are more likely to remember it and use it. Using digital business promotion and tying it with print promotion will achieve a higher level of success. Looking to run a direct mail campaign? Want to get a client letter out quickly? Acme can help you with that! Need yard signs or banners to promote your business, event or political message? We can make those, too! Acme Printing is a full-service print company that can provide you with everything from business cards and letterhead to direct mail postcards to street banners promoting your latest sale. With digital printing capabilities, you’ll have a faster turnaround time and the efficiency of print-on-demand. The ability to do smaller quantities effectively results in better pricing for you. Off-set printing is great for larger quantities, it’s the best choice to provide accurate color reproduction and crisp, clean professional looking printing. With off-set printing, you can choose from a variety of paper types and weights, as well as use custom inks such as metallics and Pantone colors. By using our finishing services, you can be confident your print projects will be professionally produced and delivered on time. We offer services such as cutting, folding, collating, die-cutting/perforation, and more! With our wide-format printing, we’re able to offer you with a variety of sizes for both inside and outside banners. Has your business been looking for a way to take your marketing strategy to the next level? Call Acme Printing today at 423-581-8525 or toll-free 855-581-8528 or contact us HERE, and we will work with you from the graphic design process to the finished product to increase your revenue with print materials.